Mohammed is a Palestinian teenager who lives in the East Jerusalem neighborhood of Sheikh Jarrah. He is a student, a writer and a poet. He and his family live in a situation most of us would consider unbearable. When he was ten years old, his home was partially taken over by Israeli settlers from Brooklyn and they have been forced to share it since then. Mohammed’s story was featured in a documentary film called “My Neighbourhood”. this shallow destiny feels so deep. dive in, look for truths to keep, don’t sell your 66 years so cheap. the viewer a wider eye. This photograph of Mohammed was taken on my third visit to Palestine. 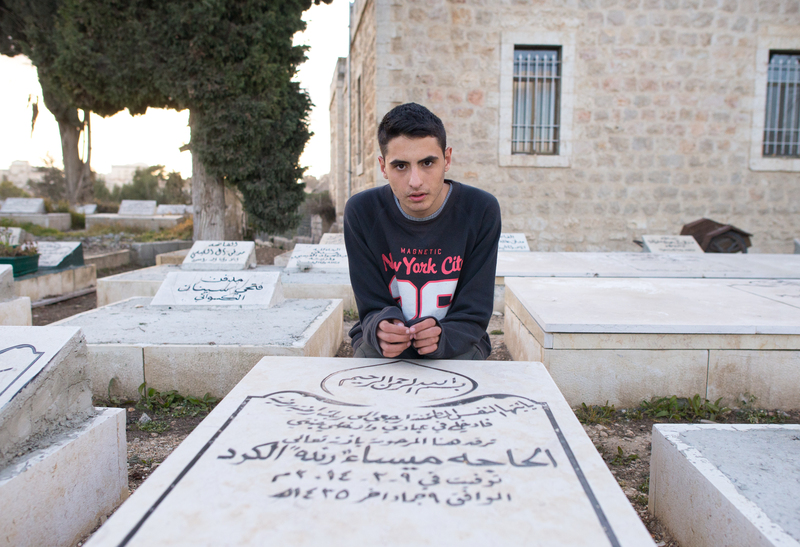 Mohammed’s aunt, Maysa’a El-Kurd, had died of cancer in March 2014, and he was taking me to see her grave. He requested that I take his photograph here. When I asked him about his New York City sweatshirt he told me that is where he wants to go to college. Mohammed is currently writing a book called “Tomorrow is Never Coming”. Keep on the lookout.